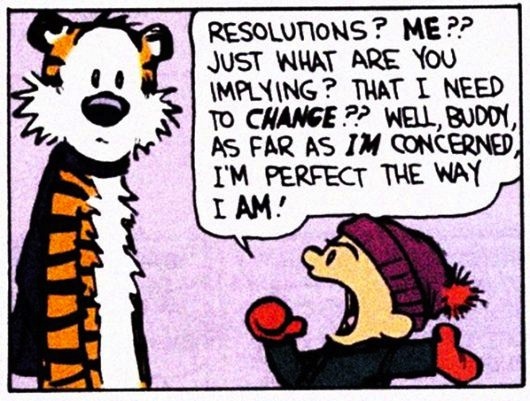 I'm joining the multitudes in creating my own New Year's resolution for 2014. This last year of 2013 brought with it many changes. A year ago today I was not all that excited to return to Tennessee to finish out my first year of teaching, although I knew that God had things for me to learn and work for me to do. So, I reluctantly returned. In June I went on a mission trip to Ecuador, which was awesome. After that I went to Indonesia to visit some missionaries. And then, in August, I started my second year of teaching and coaching. What a challenge it is to teach! In November, my sister was married and now I find myself suddenly reflecting on all that has happened in the last 365.25 days. 2007: The Year of Transition - I graduated high school and went to college, embarking on life on my own for the first time. 2008: The Year of Love - No, I am not talking about going to Woodstock in the 1960s kind of love. I learned so much about God's love and how His love marks each one of His followers' lives. 2009: The Year of Memory Loss - I really don't remember what this year's theme was, sadly. 2010: The Year of Concussions - College football will do that to ya.... I really don't remember what this year's theme was either. 2011: The Year of Surrender - Ah! I remember this one! I learned about surrendering my life to God on a daily basis. It was so exciting! I surrendered to Him especially during my last season of college football and God blessed me with recognition and awards beyond what I could achieve in my own strength. 2012: The Year of Trust - This year saw me graduating college and then falling off a cliff. I had no idea where I was going to end up. But God did. He took me to Tennessee and Proverbs 3:5-6 were hung up on my wall as a reminder to trust Him. 2013: The Year of Obedience - This last year, I was constantly reminded of the importance of obedience to God and how obeying Him really shows that we love Him. Never have I gone into a year thinking I was going to learn something specifically. It just kind of happened. But this year is different. This year I am predicting that I will learn about death. Ah! Death?! Are you serious?! Yes. I am. But that doesn't mean I think I'm actually going to die a physical death this year (although it could happen). What does it mean to die? In the Biblical sense, death is something Jesus tells us we must strive for. He says in Matthew 16:24, "Whoever wants to be my disciple must deny himself and take up their cross and follow me." Paul, in I Corinthians 15:31, says, "I die daily!" No, the Apostle Paul was not a cat with nine lives. Paul was simply carrying out the command of Jesus. But what does it mean to die? What is Jesus talking about? Why does He say to "take up your cross?" Indeed, the cross meant death in Jesus' day. Jesus carried His literal cross to the top of Golgotha and died there (only to be resurrected three days later). When Jesus says to take our cross, He tells us to die. Yes, yes. But what does it mean to die this figurative death?! This thought suddenly struck me like a ton of bricks last night as I was lying in bed. I will be humble enough to admit that in all my years of being a Christian, I only vaguely understood what Jesus meant by denying myself, taking up my cross, and then following Him. I am somewhat stupid, so I need things to be put in simple, layman terms. So God gave me this simple summary: "Don't be selfish." Ah! I get it now! Denying myself - dying to myself - simply means to not be selfish. Any time I think "Me first!" I am living in my own selfishness; any time I think "You first!" I am denying myself, taking up my cross, and taking the first step toward following Him. If I lash out in anger because someone is annoying me, though doing nothing morally wrong, then I have acted selfishly. If I get my plate of food first because I consider myself hungrier than those around me, then I have acted selfishly. If I pout in my room because my feelings were hurt unintentionally by a friend, then I have acted selfishly. If I have feelings of jealousy and greed because I feel disrespected, then I have acted selfishly. How simple, yet how profound. These last few weeks in my life I have been involved in an extreme and intense internal battle of anger at my selfishness. It has been a battle between what I want to do and what I should want to do. I am in constant tension, sometimes taking that emotional stress out on others. I want so badly to deny myself in all instances. But it is a battle that is raging on inside of me, even right now. Will I choose to be selfish or be selfless? This is why, already, I believe 2014 will be The Year of Death for me. I must die if I want to live. And I am not mentally strong enough to do this on my own, which is why 2014 came just in time. Jesus, please help me to die. "I die daily!" (Apostle Paul). 2 Things That Changed My Life! Teen pregnancy down 6%! But is that enough? Should a Christian use social media?